A touch of green paint, a blank canvas and tiny little thumbs make for adorable thumbprint shamrocks that can be displayed as art or used to personalize cards this St. Patrick’s Day. 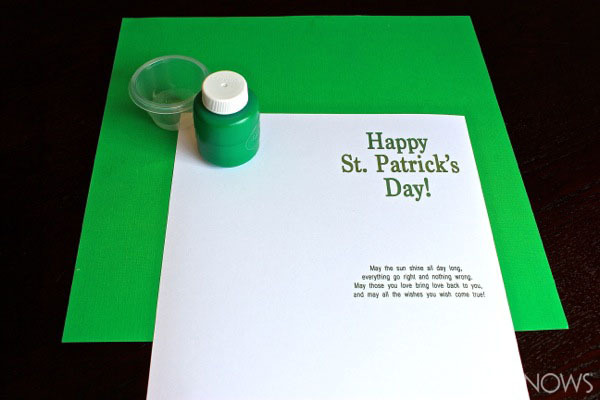 This thumbprint shamrock craft is perfect for toddlers and younger kids because it requires very few supplies and only takes a few minutes to complete. Tip: If you’re doing this craft with a toddler or preschooler, you’ll likely find that it’s not always easy to keep the paint only on the pad of their thumb. You might want to keep a wet napkin or baby wipe handy, so you can clean your child’s thumb and hands in between tries if needed. Once you have your paper set out and ready to go, it’s time for the fun part: The green thumb! Either place a drop of paint on a paper plate and have your child roll the pad of his thumb over the paint, or dip your paintbrush in the paint and paint his thumb. 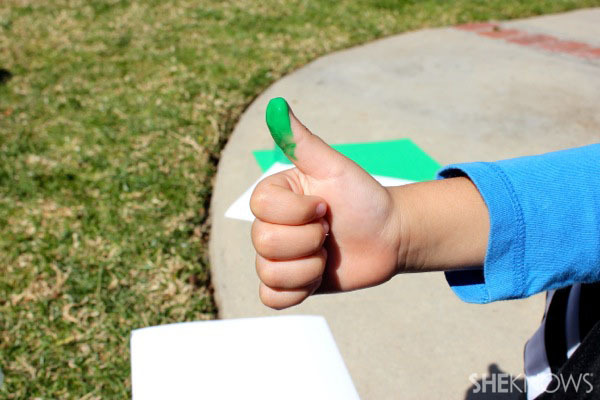 Tip: For little kids, it might help to encourage them to keep their thumb in a thumbs-up position to avoid getting paint on their other fingers or on other parts of the paper. 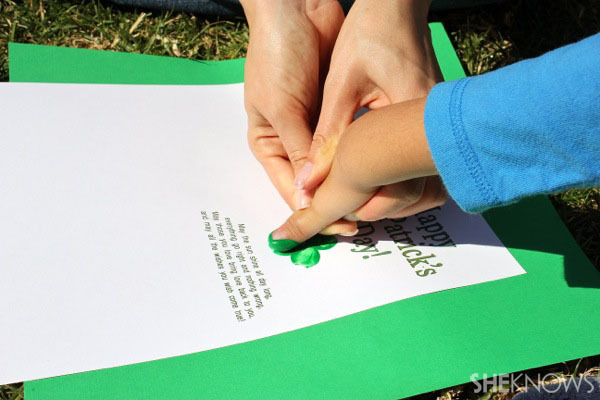 Once your child’s thumb is painted, have him press it down on the paper to create the first thumbprint clover leaf. For best results, rotate the page as they make subsequent clovers so the thumbprints all meet in the center and the tip of their thumb is always pointing out. Once the shamrock is created, dip your paint in the paintbrush and sweep it from the center of the shamrock outward to create the stem. 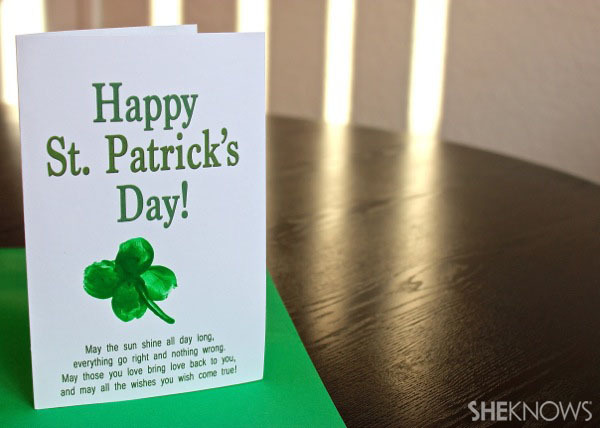 While these adorable little thumbprint shamrocks can be placed just about anywhere, they make a custom St. Patrick’s Day card even cuter. 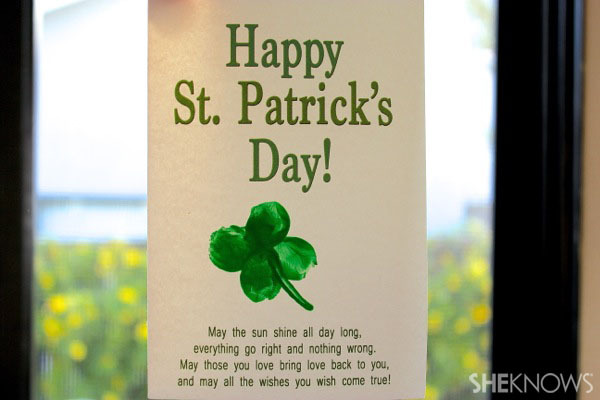 For this card that we created for the kids’ Irish grandmother, we set up the card in MS Word, included a traditional Irish blessing at the bottom and left plenty of space to add the shamrock after we printed it out. Who is St. Patrick, anyway?